Hello my peeps.... Can you tell how much I love this On the Trail die by Die-Versions? 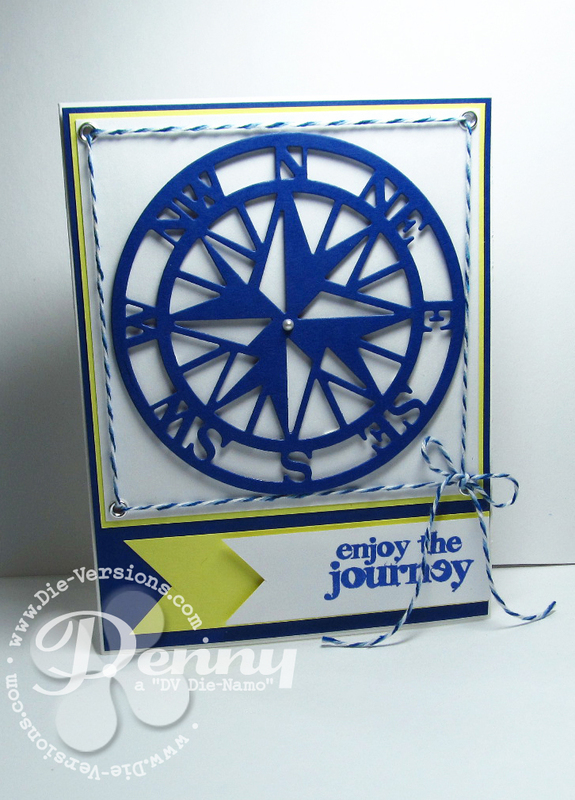 Today's card is rather nautical looking....have you noticed this as a new trend in card making? Or maybe just because it is summer? I don't know the answer, but I can tell you I am loving it!!! After die cutting the Trail die I popped it up with foam adhesive onto white card stock. Matted with yellow and adhered to a standard size Navy card stock. Used my Crop-a-dile to set eyelets at the corners, then threaded Navy & White twine. Stamped the sentiment and cut a couple of strips with a fishtail end. Fabulous! This die is on my wish list. Love how you incorporated the twine. That die is fabulous so I can understand why you love it. 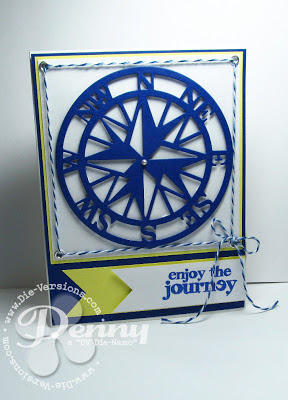 I just love how you framed it with the twine in this design and the yellow is a perfect pairing too. Great work Penny! I really like this die too Pen. There's so many things you can associate it with. Love all the different cards you've made with this one. Great work. Gotta get back into some ornate and femine things. You have an eye for the simple, but elegant design!